Travel-Tot: Safe and Happy Holiday Travels! The holidays are upon us, and for many families that means traveling to share in joyous celebrations with far-flung friends and family members! As a parent of a toddler or young child, visiting grandparents, aunts and uncles, friends, etc. can often pose a bit of a challenge; childless homes frequently contain hazards that keep you hopping up during visits to prevent your little love from breaking low lying treasures or from injuring him- or herself (i.e. candles, decorative breakables, hot serving dishes, and beautiful table linens just begging to be yanked by little hands!). While vigilant supervision during any visit is irreplaceable as an injury deterrent, there are a few things you can do to make life a bit easier on yourself (and your child!) during holiday visits. Investing just 15 minutes to create a "safe zone" for your child to play in could facilitate a more relaxed and enjoyable visit. Start by visually inspecting each room thoroughly from the vantage point of your child. Get down low: look beneath and behind furniture, drapes, sinks, toilets, and heaters for loose pills, pins, or other overlooked items that could pose a choking or poisoning hazard - you may be surprised what you find. Also, remove tiny, fragile, top-heavy, burning, hot, or sharp objects from reach (table tops, shelves, hearths, etc.). Finally, be sure cords (electrical, blinds, decorative, etc.) are coiled up out of reach and keep doors to laundry rooms, stairways, kitchens, supply closets, and bathrooms closed or gated-off from access during the visit. 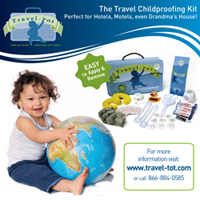 To help create an additional layer of protection, invest in a Travel-Tot Childproofing Kit; the kit components (foam corner guards, outlet covers, pinch guards, etc.) can help prevent injury from some of the most common hazards present in living spaces! Best of all, the Kit's components go on with a strong, temporary, non-damaging adhesive that will not damage furniture or finishes; and Kit components can be reused! It is a quick, easy solution you can store in your car for wherever you go; or consider picking one up as a gift for your parents, in-laws, or other friends or family you visit during the holidays! Creating a safe play zone in a childless home may take a few minutes, but it will result in greater peace of mind for you and a more enjoyable visit for everyone! Safe and happy travels and best wishes from all of us at Travel-Tot for a joyous and blessed Thanksgiving! This is great! Our first daughter spent her entire first year traveling in an RV with us because we are artists and had a big touring show scheduled. Another great tool is shoe snaps from www.wearapear.com to keep kids shoes together while packing and unpacking so you aren't always missing a shoe!...they were created by moms for moms!